Driving with a cellphone in your hand would be banned in Virginia under a bill approved this week by the state Senate. The bill now goes back to the House of Delegates. WASHINGTON — Driving with a cellphone in your hand would be banned in Virginia under a bill approved Tuesday by the state Senate. The bill, which now goes back to the House of Delegates, would change Virginia’s current ban on texting or emailing while driving to cover all hand-held cellphone use behind the wheel. To use a phone as a navigation system, the revisions championed by Fairfax County Sen. Scott Surovell would require the phone be mounted to the dashboard or another part of the vehicle. The ban would not apply in the case of emergencies, when lawfully parked or stopped, for citizens band radio use, or for any use of a feature built-in to the car. “If it’s not an emergency, then I don’t know why putting other people’s lives at risk, like the 5-month-old that got run over in Loudoun, or Kyle Rowley, that got run over on Route 7 back in 2011, why those lives are more important … than that phone call you’ve got to pick up,” Surovell said. Hands-free use of a phone would be allowed. As with violations of the current law, the traffic infraction would be punishable by a $125 fine for a first offense and $250 fine for any additional offenses. 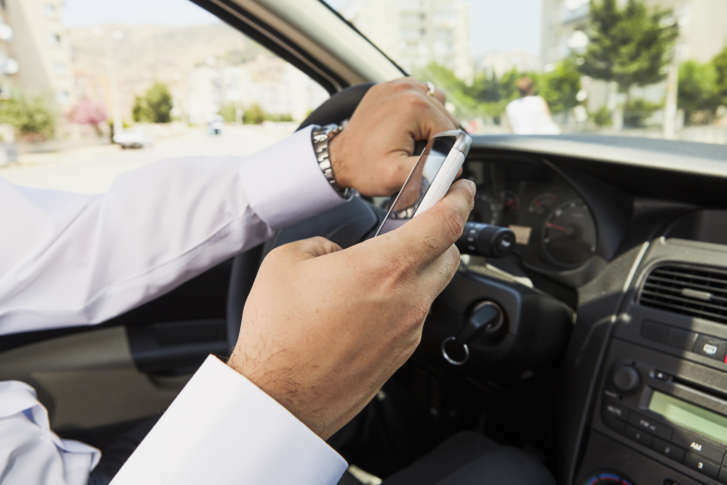 Making hand-held phone use illegal behind the wheel could also provide a basis for additional consequences, such as legal liability in a civil suit in the event of a crash. “Law enforcement cannot enforce our current law; it doesn’t work … because they can’t tell if they’re chasing Pokémon, or they’re playing Angry Birds or whether they’re actually sending a text message,” Surovell said. Similar bans on hand-held cellphone use have been in place in Maryland since late 2013 and in the District since 2004. “This is legislation that we need to pass … to make our streets safer and to save lives in Virginia,” Surovell said. The House of Delegates only narrowly passed a much narrower version of the bill on Feb. 13. The 50-47 vote signals a potential challenge for the broader safety measure passed by the Senate as the bill returns to the House with just days left before the scheduled end of the session Saturday. Sen. Ben Chafin opposed the broader measure in the Senate Tuesday because he said many constituents who use their phones while driving would complain. “I agree we have a problem with distracted drivers, but this is hitting that problem with a sledgehammer,” Chafin said. Sen. Amanda Chase supported the bill on her son’s 16th birthday. “Which is more costly? The cost of a life versus the $6 it’s going to cost me to get a cellphone mount for my car?” she said. “Sometimes it’s an inconvenience to be safe, and in this case, I think it’s worth it for our kids and for our families,” Chase added. Prince William County Sen. Jeremy McPike said his own wake-up call recently came when his teenage daughter asked him to give up using his cellphone while driving for Lent. “I was kind of busted,” he said. McPike hopes if the bill becomes law, it could send a wider message and help prevent dangerous distracted driving. Fairfax Sen. Chap Petersen’s amendments aimed at instituting best practices and collecting data on enforcement of new rules were adopted 29-11, but not without being panned by Senate Majority Leader Tommy Norment, who appeared to question whether concerns about racial profiling of drivers are legitimate. Under an additional amendment added by Norment, the data would only be collected if Virginia State Police had money available for a long-suggested upgrade to an electronic summons system.